In high school I worked at an Italian Pizza Joint as a waitress. I have so many great memories of working there, it was a blast. The food was delicious, they had everything you would imagine pasta, pizza, subs, and salads. At the end of every night, I was able to order anything off of the menu. I would without a doubt always order the tossed salad with house dressing, and one other dish: sometimes lasagna, sometimes meatball subs, ravioli, onion pizza, chicken marsala, or chicken parmigiana. Awww, those were the days when I didn't keep kosher. I love to recreate many of those dishes at home now. I actually still remember how they would make it in the kitchen there. Yes, I was a waitress, but of course I was drawn to the kitchen. The owners of this restaurant pretended to be Italian, although they were actually Albanian. If you have ever been to one of these "Italian" restaurants, then you for sure have had the amazing Albanian red house dressing or tomato vinaigrette. 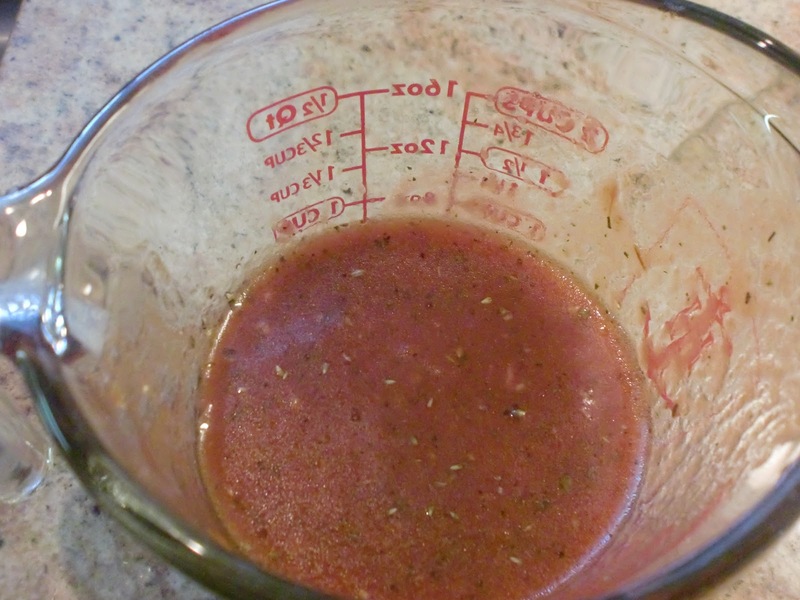 If you were to ask for this salad dressing recipe, they would never ever ever share it with you. Lucky for you, I happen to know the secret recipe. I witnessed them making huge batches of it some 11 years ago. 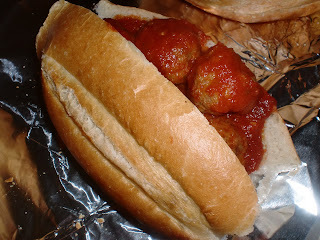 My other favorite thing I would eat there was the meatball subs. Yum! 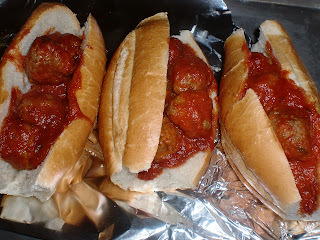 Below, you will find my recipe for meatball subs (theirs were good, but they used premade meatballs). I can't wait to make this for dinner again, it was excellent. In the words of Prince Hock, "You make the best dinner Mommy, I love you!" Mix together the meat, egg, soymilk, bread crumbs, garlic, black pepper, salt, oregano, and parsley. Pour the marinara sauce and water into a large pot. Make golf ball or smaller sized meatballs. Place the meatballs into the sauce. Place over the stove and bring to a simmer, lower heat to lowest setting, but still simmering gently. Cover with a lid, and simmer for 2-3 hours. Stirring every so often making sure the sauce isn't burning. Preheat the oven to 450 degrees. Cut the bread in half, but not all the way through. Place meatballs with sauce inside. Place the filled rolls on a sheet pan. Bake for 5 minutes or until nicely toasted. You must make this, you will be in love. Whisk together the chili sauce, vinegar, and oil until emulsified. Add the remaining ingredients, and mix until thoroughly combined. Can be stored in the refrigerator for up to 1 week. 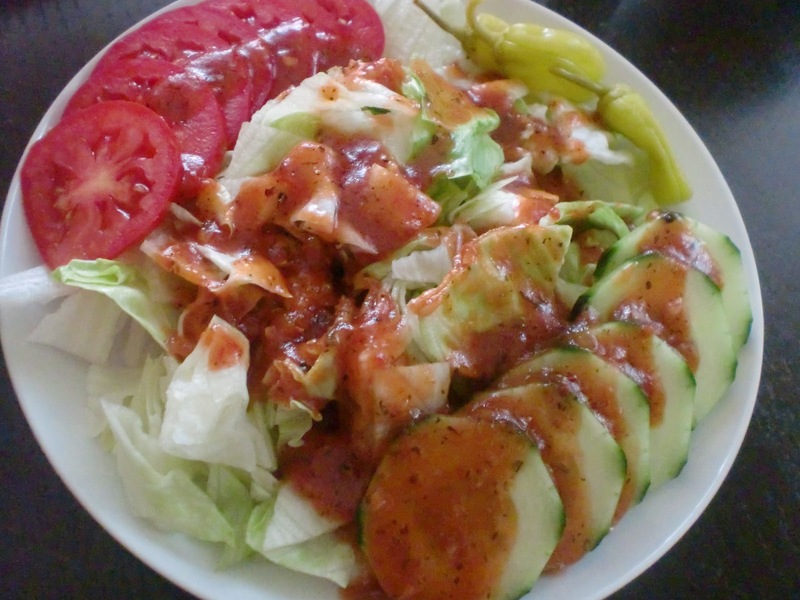 If you want to serve it identical to the restaurant I worked at, chop up some iceberg lettuce, slice cucumber, and tomatoes, and place it all on a salad plate with a few pepperoncinis.